We are proud to announce we will soon be moving to a new location with a new face that will enhance the Edmonton cityscape. Check the Building Project section for a detailed review of the project and an opportunity to make a donation to this exciting venture. You can also view construction progress reports detailing the current status of the construction. The News section contains summaries of current news releases and museum events and copies of the newsletter. In the Photos section you can view a photo journal of museum events and the building project. Are you looking for a gift? We have a selection of Shostak prints for that special occasion. Please make yourselves at home, and enjoy your visit. 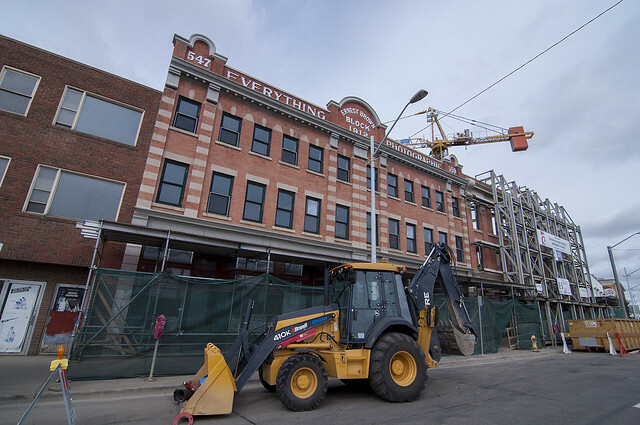 Edmonton photographer Hugh Lee has graciously undertaken to chronicle the progress of our museum’s construction. He will be taking photos on an ongoing basis throughout the construction, and we will display them in this gallery. They may also be viewed on Hugh’s Flickr page. UCAMA is grateful to Hugh for agreeing to take on this historical record of the Pendennis/Lodge Hotel’s metamorphosis into our new museum.